Songs and Themes from the Latest Movies and Television Shows (Violin). Arranged by Various. Play-Along; String Series. 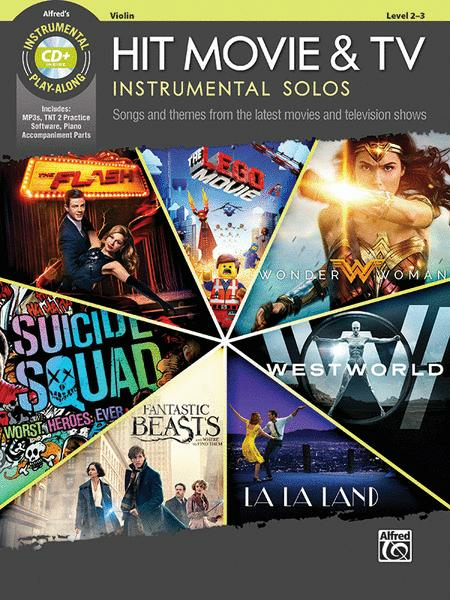 Instrumental Solos Series. Movie; Pop; TV. Book; CD. 28 pages. Alfred Music #00-46774. Published by Alfred Music (AP.46774). Titles: Titles: Amazons of Themyscira (Wonder Woman) * Another Day of Sun (La La Land) * Beauty and the Beast (Beauty and the Beast) * City of Stars (La La Land) * Everything Is Awesome (The LEGO Batman Movie) * Ghostbusters (Ghostbusters) * Heathens (Suicide Squad) * Just Like Fire (Alice Through the Looking Glass) * Kowalski Rag (Fantastic Beasts and Where to Find Them) * A Man and His Beasts (Fantastic Beasts and Where to Find Them) * Mia & Sebastian's Theme (La La Land) * Newt Says Goodbye to Tina / Jacob's Bakery (Fantastic Beasts and Where to Find Them) * Runnin' Home to You (The Flash) * Westworld: Opening Theme (Westworld).